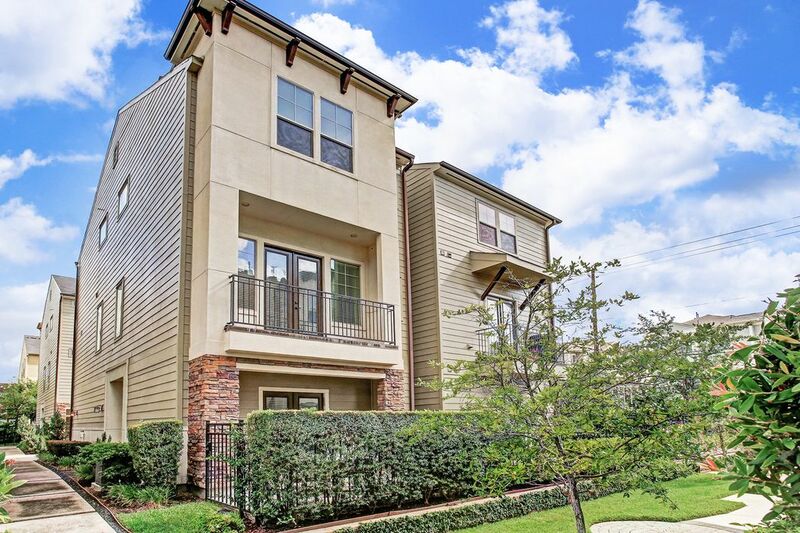 2407 Beall Street, Houston, TX 77008 | Martha Turner Sotheby's International Realty, Inc.
Beautiful town home nestled on a coveted lot in the middle of the neighborhood greenbelt. The space provides privacy from neighbors as well as peaceful views. The handsome home facade features a combination of stucco and stone. Open spaces define the second floor, which features gleaming hardwoods, oversized windows and French doors to the balcony. 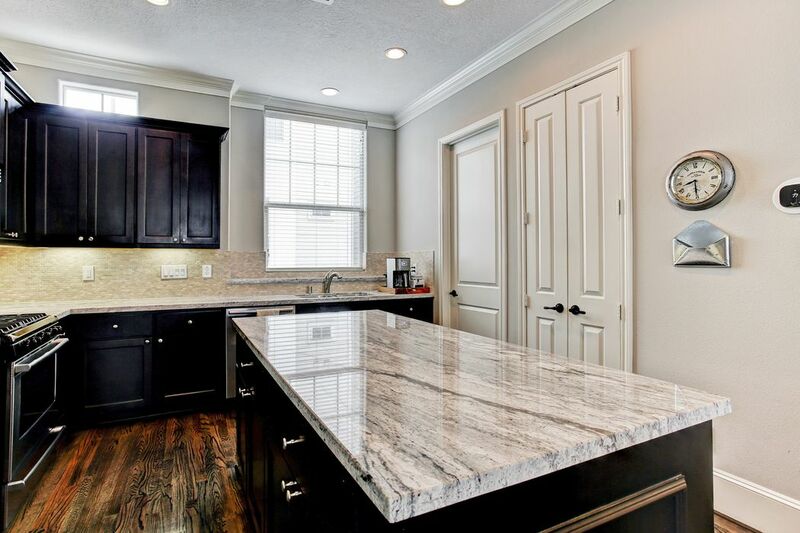 The kitchen has stylish black cabinetry, stainless appliances, granite and a decorator back splash. A roomy dining area has plenty of space for guests or can accommodate a small group. 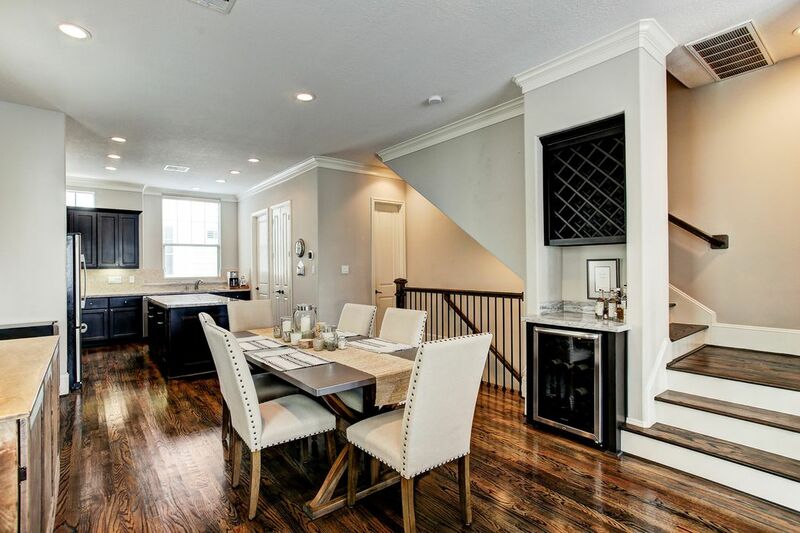 Note the dry bar with wine cooler tucked under the stairs. 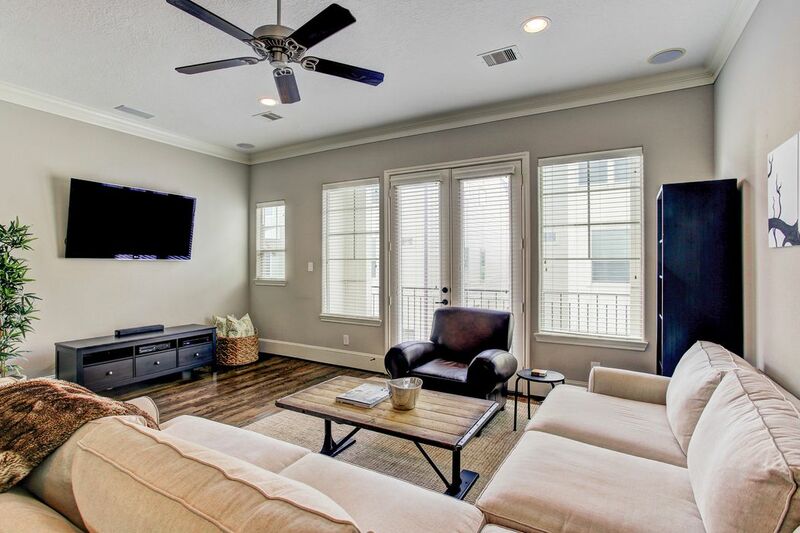 Flooded with ambient light, the spacious living room opens to a balcony, perfect for relaxing with a glass of wine. 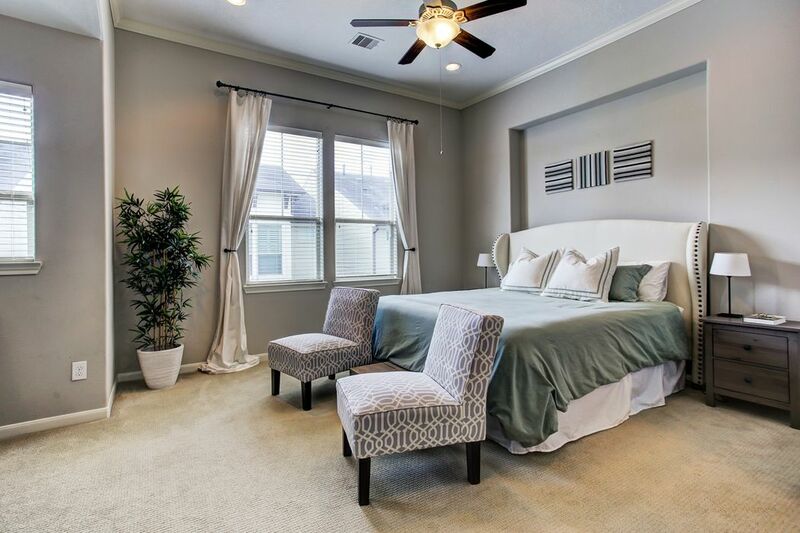 Tranquil master suite is notable for its neutral color, luxe carpet and gracious spaces. 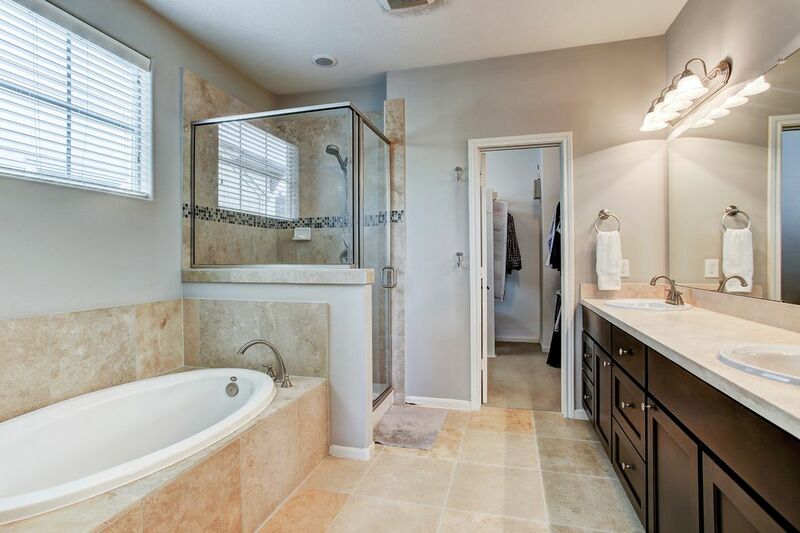 Master bath with great ambient light, dual vanities, large walk in shower and soaking tub. 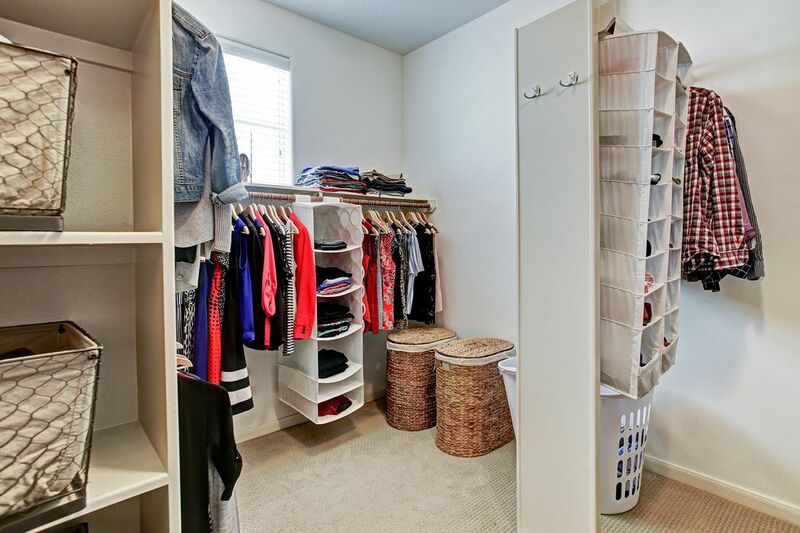 Oversized closet is accessed through the door to the right. What a closet! Space for everything and then some! 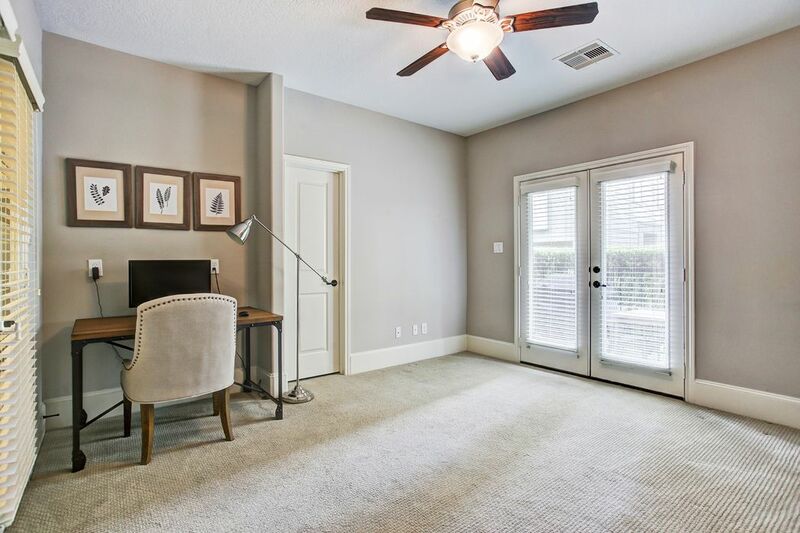 This cozy patio off the third bedroom/study has a privacy hedge and gate for easy access to the neighborhood greenbelt. HOA fees cover the cost of all landscaping. This first floor room is being used as a study, but has a full bathroom and large closet accessed through the door to the left. Double French doors lead to the patio. On the far left, double French doors provide privacy from the foyer. Welcome home! 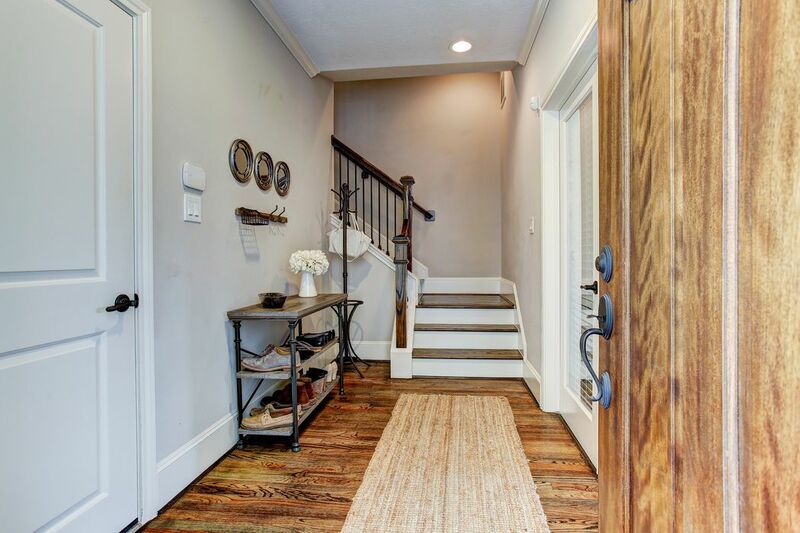 This stylish foyer invites you in! Garage door to the left. Another view of the chef's kitchen. Double doors on the right lead to the pantry. The other door is to the spacious laundry room, which houses a full sized washer/dryer side-by-side that convey with the unit. This view from the balcony looking into the living spaces. Note the powder room conveniently located at the top of the stairs leading up from the foyer. 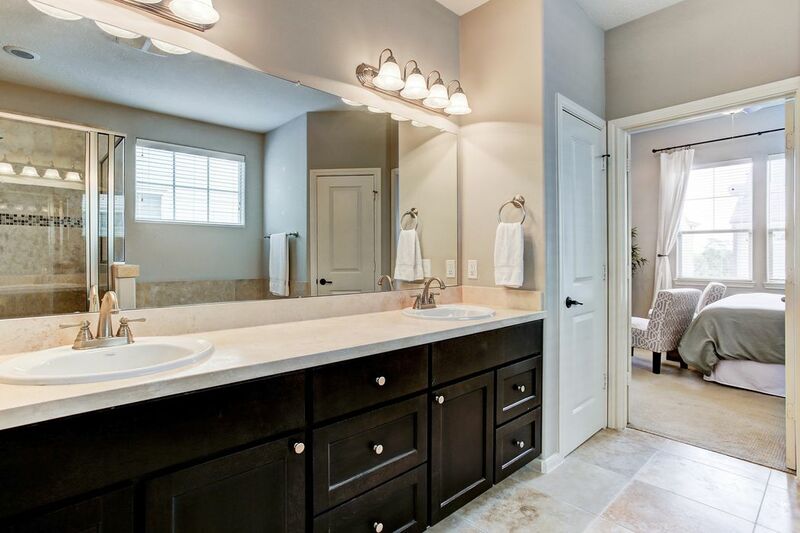 Wall-to-wall mirror, designer lights, dual sinks and neutral granite and travertine floors define the master bath. 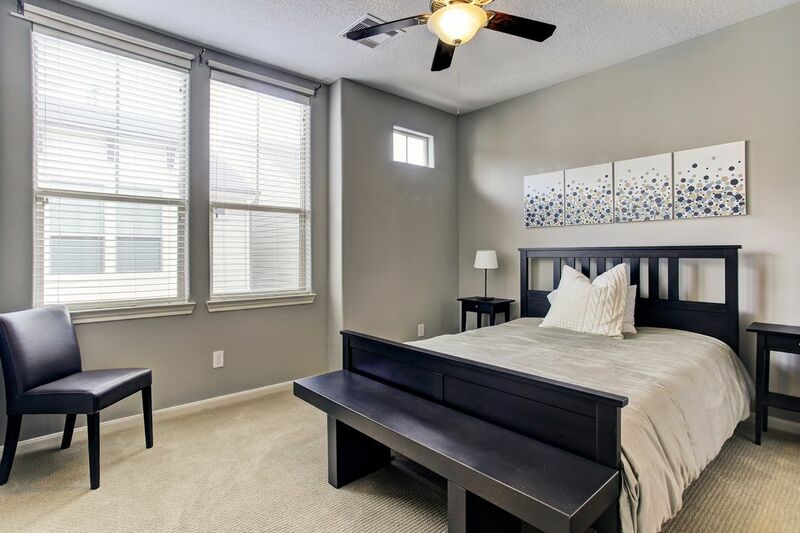 Comfortable second floor bedroom on the third floor is ensuite with luxurious carpet, neutral colors, fan and window shades. $380,000 3 Bedrooms3 Full / 1 Partial Baths2,073 sq. ft. 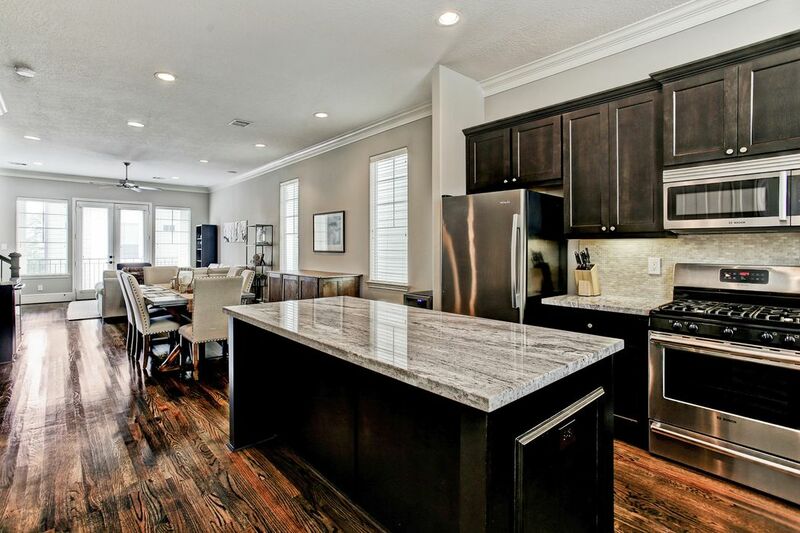 Stunning three-story town home is comfortably nestled in a gated community, right in the center of a greenbelt. 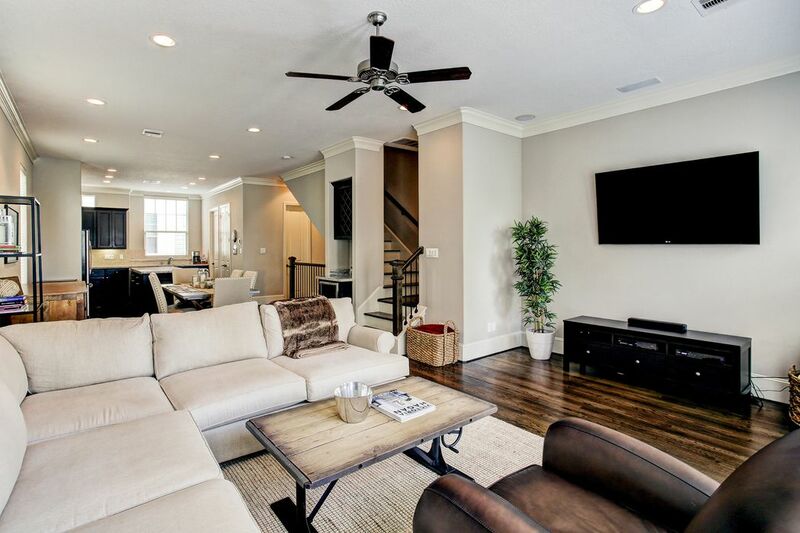 Outstanding features include a beautiful patio, French doors, chef's kitchen with granite countertops and glass tile, roomy open spaces and a huge master suite with spa-like bath and oversize closet. 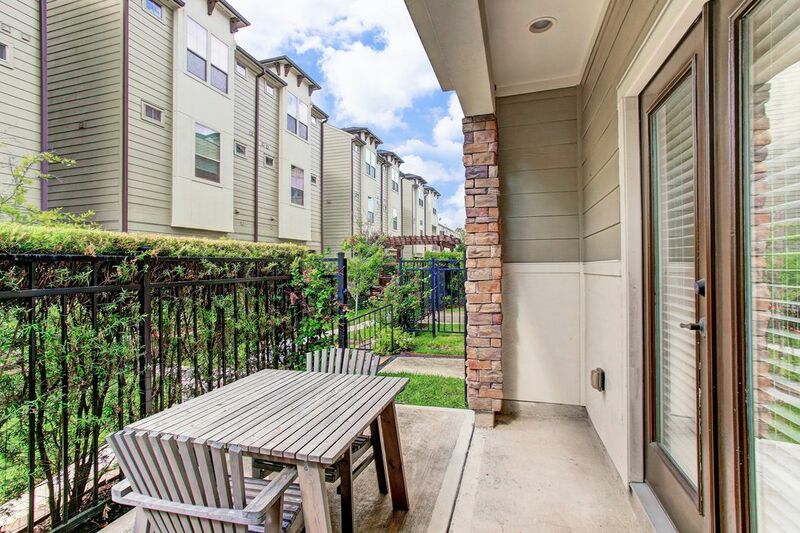 Located close to shopping, hip restaurants and bars and easy access to Downtown, Texas Medical Center and the Galleria.